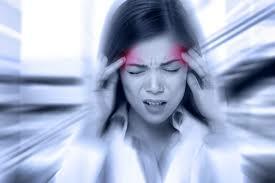 According to a friend who is, amongst other things, a medical doctor, all “types” of migraines are due to the capillaries in the shoulders, neck and head contracting, therefore restricting blood flow to the head/brain, so they need to be relaxed (dilated). When a doctor says your problem is due to your genes what it really means is that you are simply more susceptible that other people are. Mineral Solutions (L. Arginine), Cell Protect (Ginko Biloba, vitamin E etc), Endurance (Cordyceps Sinensis, ginger etc) and Omega 3 (EPA, DHA and Vitamin E), Protozymes (probiotics). Walnuts, peanuts, almonds, chicken, turkey, chick peas, lentils, (in fact all legumes) —-they contain the amino acid L. Arginine. Fresh spinach, beetroot (raw in green juices and cooked), parsley, ginger root, a small amount of Cayenne pepper, garlic. Brown rice, cooked green veg (eg. broccoli, spinach, chard, kale, Spring Greens). Drink 2 litres of pure water each day. Just over a year ago, Modere launched a new Weight Management system in the US market and it has taken off like a rocket. Why? Because it is simple to use and follow, IT IS NOT A “SLIMMING” DIET and there is no need to feel hungry. 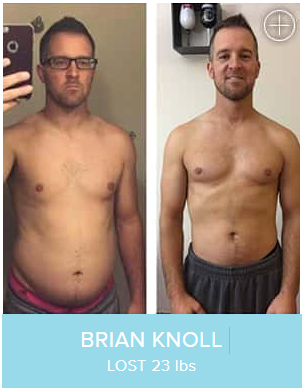 In April of this year my friends Jo’ and Larry went to Utah and were blown away by the results people were achieving and managed to get a two month supply and bring it home to use – look what happened. 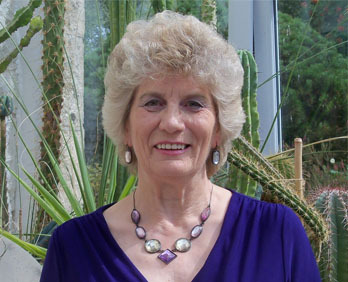 “I am 65, a type 2 diabetic (the drugs don’t help with weight challenges) and in April weighed 15st 7½ lbs with a 38” waist. Within the two months of M3 my results were remarkable. My life and fitness levels improved dramatically – everyone remarked on the changes in me. Not only did those unwanted pounds drop away but my waist size reduced dramatically. Gone were the 38” waist flat front trousers and on with modern 34” waist skinny jeans and trousers – It was a GREAT feeling my weight had dropped an amazing 18lbs to 14st 3½lbs and I had finished my supply – I had to wait for the launch. Then came the great news. Modere Europe allowed 400 people to qualify for a 3 month trial beginning at the end of June prior to the launch of this fantastic system at the beginning of September. I haven’t been this light for over 20 years and the best part is I am not hungry at all!!!!! There are three products, Ignite is 2 capsules twice a day to raise your metabolism and help you burn more fat. Sustain is a shake powder that you take any time during the day when you start wanting a snack (either mid-morning or mid-afternoon). 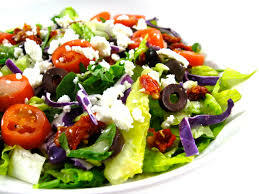 You continue to eat meals but following the Mediterranean diet. I don’t get hungry. Sync is a chocolate flavoured shake for the evening. Again not a meal replacement but simply to cope with any ‘snack pangs’ and can even be made a wonderful hot chocolate drink. FOR 3 The Pledge is for 3 months – that soon flies by! DO 3 You pledge to do 3 out of 5 activities. Not difficult I know but here is the good news. You only have to choose 3 out of 5 and can swap your choices at any time. 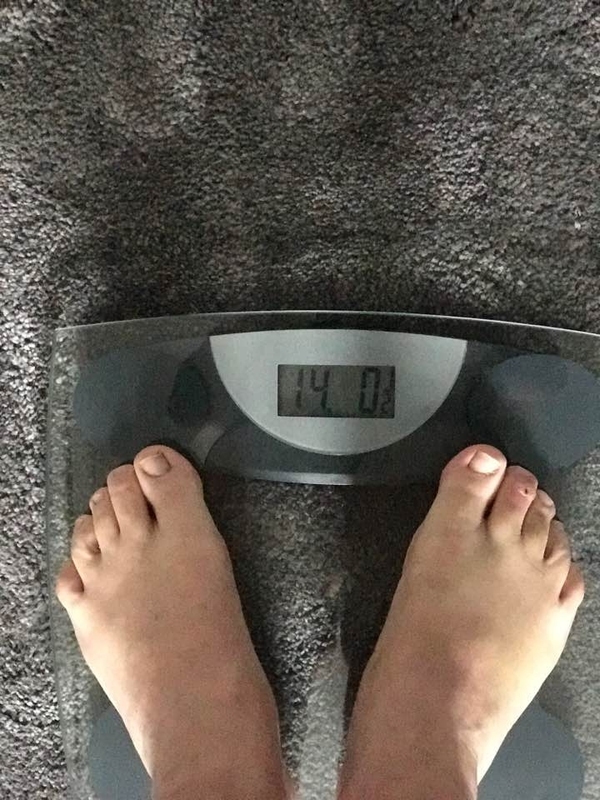 In fact Larry has recently undergone surgery on a toe and cannot really walk for a month but he is still keeping his weight programme going by ‘doing’ 3 . NOW THAT GOT YOUR INTEREST – WHAT ABOUT THIS? OK so you are interested – who wouldn’t be with the results I have shown you. 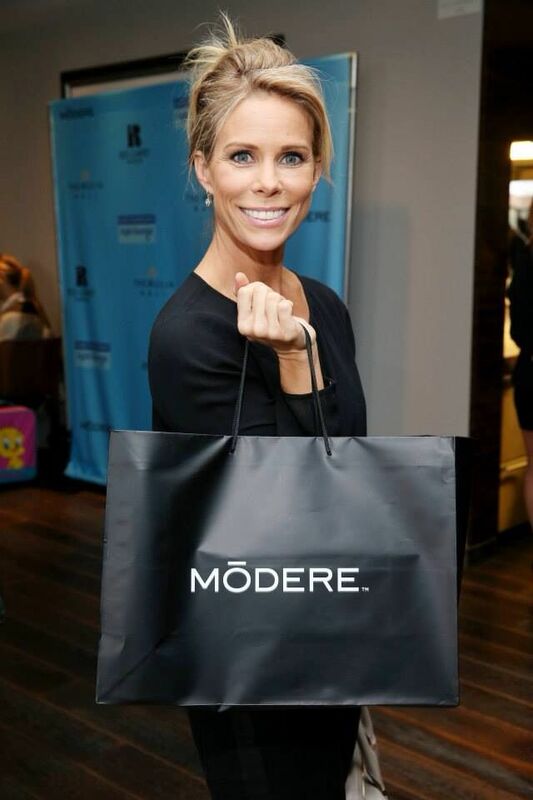 The Modere M3 System has taken the US market by storm. Why? Because it produces results (follow the M3 Pledge and they are guaranteed) and because of those results people are sharing this product and that has exploded the sales. How does it work? What makes this so different? Well watch this video featuring Greg Horne the scientist behind this amazing formulation and then in my next message I will share with you how to become one of the very first Europeans to get your hands on M3 and as a new customer you can even use a special promotion code I will give you to receive £10 off your first purchase. This is just over 5 minutes so watch the whole video and then send me a message telling me how you excited that makes you feel. Our bodies are fat-burning machines NOT carbohydrate-burning machines because originally our diet consisted of flesh, fruit, green plants and the occasional root and, contrary to what we have been brainwashed into believing, low-fat and fat-free diets have been injuring and slowly killing people for decades! They have fuelled the Obesity Pandemic. Fat provides twice the energy per gram than carbohydrate or protein provides! “No fat in the diet = no fuel to burn calories”. The body requires energy to keep its metabolism properly functioning, and a 2007 study published in the American Journal of Clinical Nutrition found that consuming fatty acids can boost metabolic health. Furthermore, anyone wanting to get rid of body fat stored around the belly, thighs, or buttocks (also called subcutaneous fat)—needs to eat fat because this “new” fat to help to break down the “old”, stored fat by activating fat burning pathways through the liver. A good addition to the diet is avocado. Fat isn’t the easiest nutrient to digest, so it sticks around in the digestive system for more time than many other nutrients.. That means you feel full longer, and you won’t feel the stomach-growling urge to raid the refrigerator after mealtime. 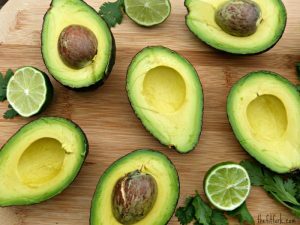 MUFAs(Monounsaturated fats) may also help stabilize blood sugar levels, according to Mayo Clinic. 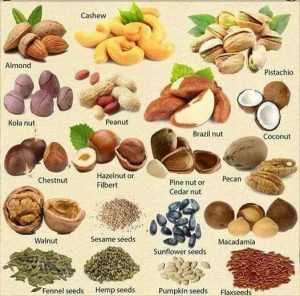 Nuts and seeds….. include almonds, peanuts, cashews, Brazil nuts, hazelnuts, macadamia nuts, pecans, and pistachios. Nut butters such as peanut butter, almond butter and cashew butter. 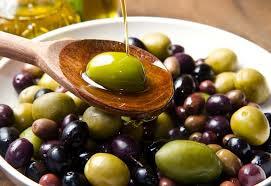 Other Foods….. avocados and black or green olives. In fact, diets with high amounts of omega-3 fatty acids, a type of PUFA (Polyunsaturated fats) that the body can only acquire through food, create a greater sense of fullness both immediately following and two hours after dinner than do meals with low levels of the fatty acids, according to a 2008 study from University of Navarra in Pamplona, Spain. 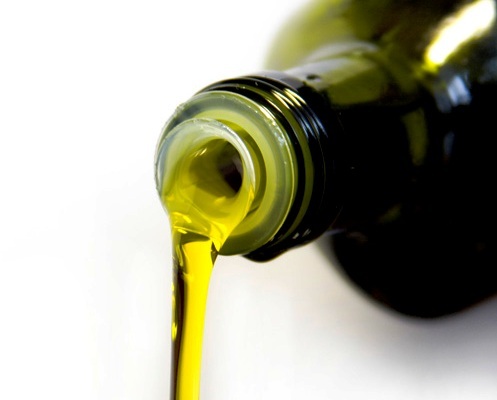 It’s no surprise that dieters who consume moderate levels of fat are more likely to stick with their eating plans than dieters who consume low levels of fat. Benefit = more weight removed! We’re programmed to like the taste of fat because the body knows it needs fat – so when fat is missing, we get bored with what we’re eating and eat “tasty food” which is full of nutrient-poor carbohydrates eg processed foods such as breads, biscuits, cakes and manufactured “meals”! On an even happier fat note, omega-3 fatty acids (EPA and DHA from fatty fish) can boost serotonin levels in the brain, helping to improve mood, increase motivation so you’re not tempted to eat high carbohydrate dishes like pizza and nutritionally devoid dishes. Eat wild caught fish only. It’s a good idea to eat mainly small fatty fish like sardines, herring, and sild because larger fish like salmon, tuna, swordfish and mackerel (even wild caught) tend to contain pollutants like PCBs, dioxins and mercury which can accumulate in the body, so don’t eat them more than twice a week. Eating good fats along with an effective exercise program can increase muscle and increasing muscle mass is vital to increasing metabolism and burning calories both in and out of the gym. Muscle weighs more than body fat and this is why you should measure yourself not weigh yourself to check on progress! 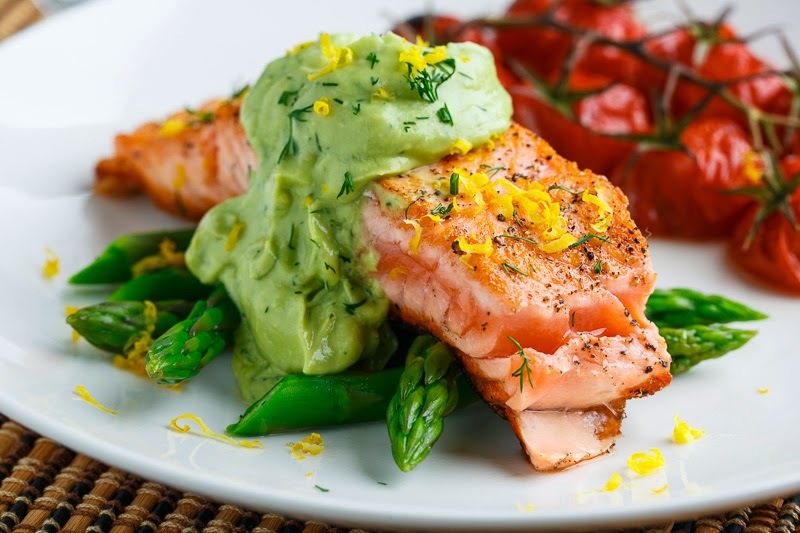 In a 2011 study published in Clinical Science, researchers examined the effects of eight weeks of omega-3 supplementation in adults ages 25 to 45 and found that the fat increases protein concentration and the size of muscular cells in the body. Previous studies have found that omega-3 fatty acids stimulate muscle protein synthesis in older adults and can mediate muscle mass loss due to aging. Many nutrients are fat-soluble, meaning that the body can’t absorb them without fat and if your body isn’t absorbing nutrients properly, that can result in deficiencies in Vitamins A, D, E, and K, leading to dry skin, blindness, brittle bones, muscle pains, and abnormal blood clotting. These vitamins are also vital to maintaining energy, focus, and muscle health, all of which contribute to a healthy weight. Vitamin E, for example, is a powerful antioxidant and helps maintain your metabolism and, according to a clinical trial from the University of Minnesota Medical School, the body’s levels of vitamin D (from sunlight) predicts its ability to lose fat, especially in the abdominal region. So while you enjoy your salad with nutrient-rich spinach, almonds, sunflower seeds, tomatoes, carrots and egg yolk, you really need to thank the olive oil and avocado for sending the salad’s vitamins your way. These 5 are just a few of the many reasons we need EFAs. harvested before it’s ripe – marketed as “Ripen at Home”—except that to ripen means to becomes full of nutrients and that can only happen whilst part of the plant!! picked ripe but then stored – on average for 6 months – so nutrients disappear. Therefore it’s vital that we supplement our diet with nutritional supplements. Challenge…..how to know which are effective and which are a waste of money! 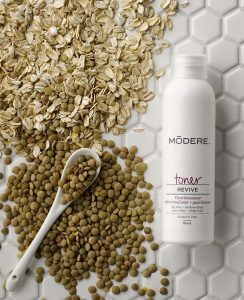 In my experience, Modere are the best choice because for more than 30 years they have provided carefully formulated supplements containing therapeutic amounts of top class nutrients which I have seen bodies use extremely effectively, time and again; plus the safest, most effective personal care products which do not lead to a toxic body! 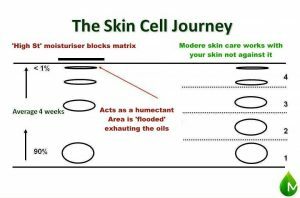 Why Modere Skin Care Products Really Are Skin CARE Products. Well the answer can often be found in the skin care and cosmetics that women use, where the ingredients can prematurely age the skin. Until recently, men haven’t used them. When choosing skin care products we need to be aware of ingredients, such as propylene glycol, which block the skin’s matrix because, due to their molecular size, they sit on top of the skin like a plastic bag, preventing the skin breathing and getting rid of waste. This causes spots and sensitivity. 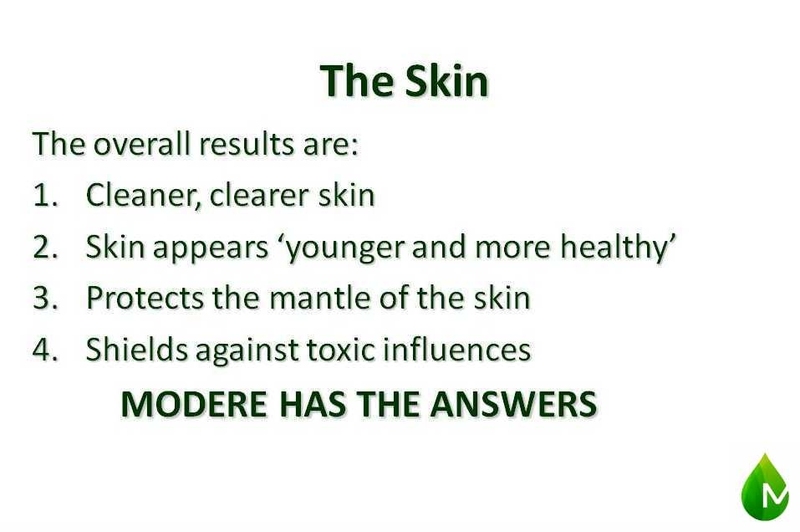 (The skin is a major detox organ). 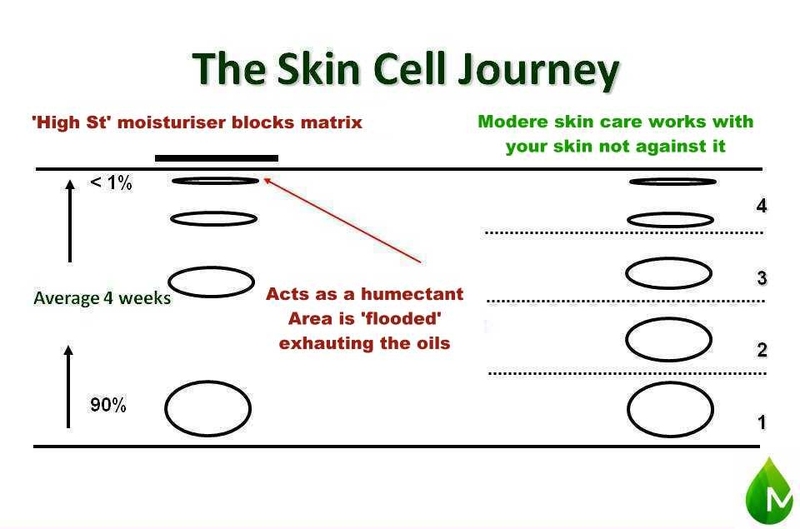 In order to try and wash away this blockage, moisture is drawn up from live cells beneath, thus plumping up the top cells giving the skin a “healthier appearance”. 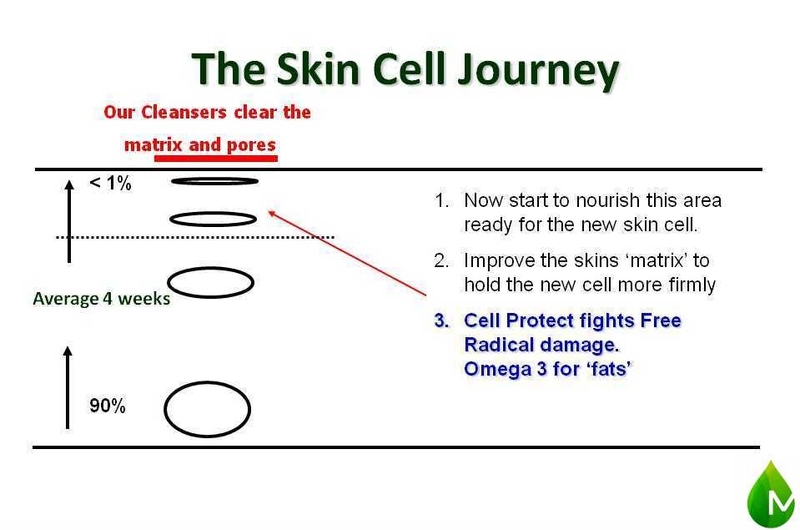 What it is actually doing is damaging the newly formed skin cells = Aging them. If you put a waterproof plaster on your hand and leave it overnight, when you remove it, your skin will be pink, moist and plump – the same effect! 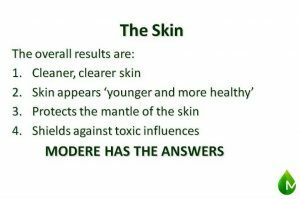 Modere Skin Care does not do this. Modere’s philosophy is to work on the 4th week area and try to retain 2% moisture. DOUBLE THE SKIN CELL MOISTURE. 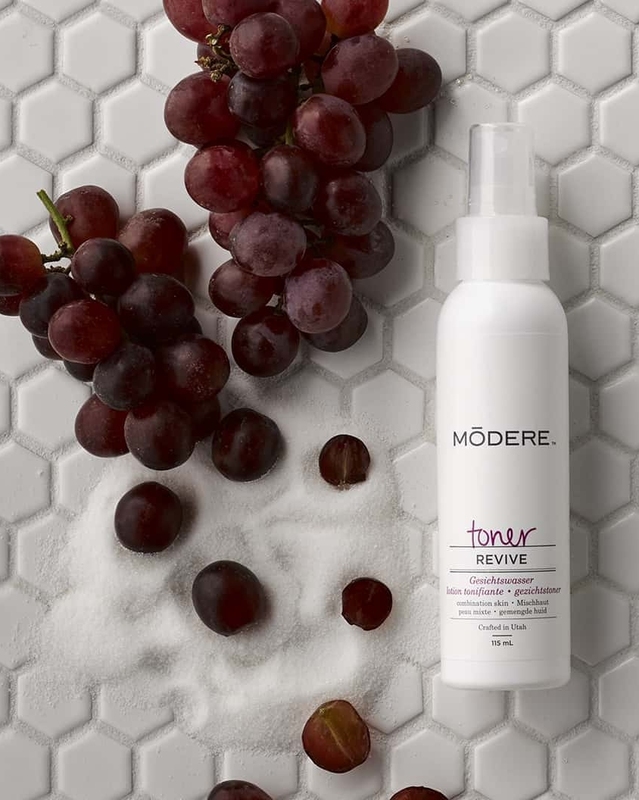 Modere Skin Care products (like the rest of their products) are always based on the latest scientific research, using ingredients which make the products safe for us to use AND which are effective. Our cleansers penetrate the skin, gently washing away dirt and impurities from the matrix and the pores. Our clarifier gently removes dead cells from the surface without damaging the mantle of the skin. 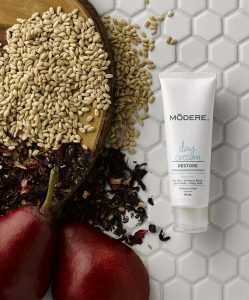 Modere Skin Care is designed to defend and enhance the health of the skin as well as improve its surface appearance. It really doesn’t have to be complicated. 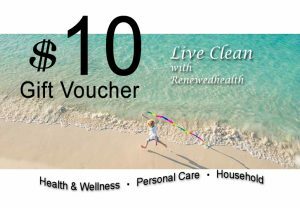 Our skin care can be broken down into five regimen steps. 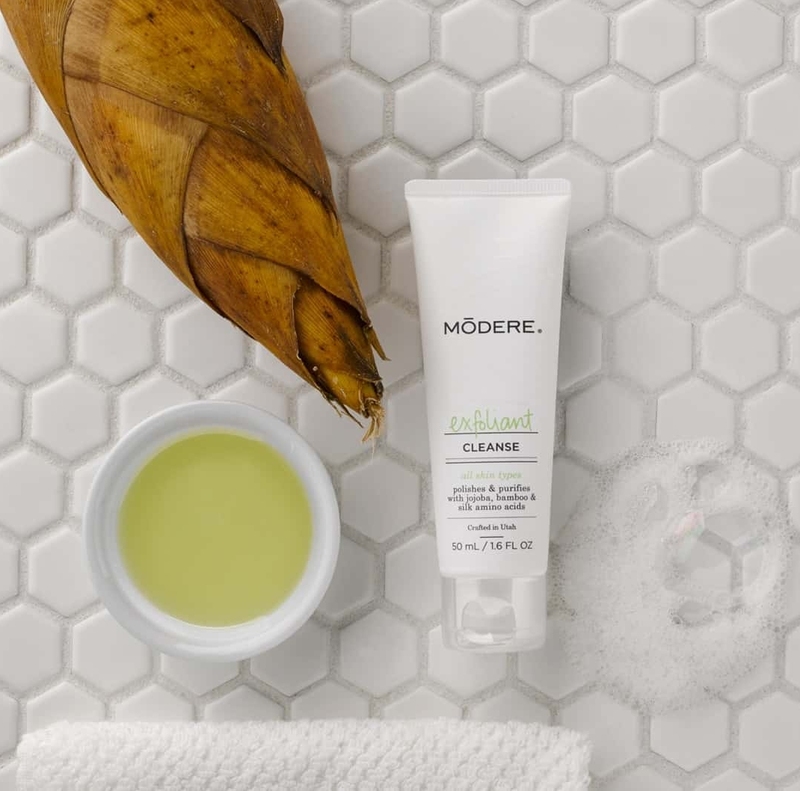 Whether removing your make-up or lifting the day’s accumulated dirt and impurities, cleansing is the essential start to your skin care regimen. This unique, liquid formula is perfectly crafted for powerful and thorough eye makeup removal. It provides an “oil phase” to gently dissolve waterproof eye makeup, and a “water phase” to eliminate water soluble eye makeup while conditioning eyelashes and surrounding skin. This mild formula effortlessly clears delicate skin of the most stubborn eye makeup and other residues, preparing it for effective cleaning. The blue colour is not for visible effect. It comes from the copper sulphate whose purpose is to make the pH of the product the same pH as our tears so that the eye is protected. There are 2 skin types — dry (mature) and normal/combination skin. Sensitive skin is not a “type”, it is damaged skin. 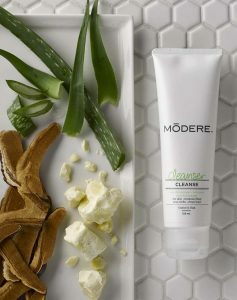 Each cleanser is a mild formulation that respond to the skin’s cleansing needs. 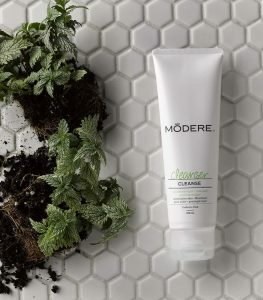 The cleanser for Normal skin accommodates a wide range of normal skin variations and preserves the skin’s delicate moisture balance to create a perfectly clean complexion ready for nourishment. 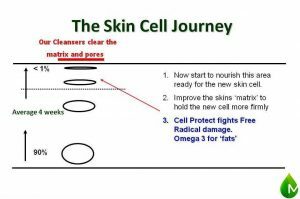 Benefits gained by the removal of dead skin cells. Washing and towelling removes most dead cells but not all and they stay on the skin’s surface. Light is reflected back from the surfaces of these dead cells in all directions so the complexion looks dull. When the skin is smooth, light reflects back smoothly in one direction only and the complexion looks radiant and glowing! Can Men Benefit? Yes. These dead cells act like “speed bumps” to a man’s razor, quite often causing nicks and bleeding, blunting the razor. Use:- Cleanser/Clarifier — Shaving Cream —- Balm. The results are a smooth shave and the razor lasts longer! Exfoliator is a mild exfoliator that gently sweeps away dead skin cells and surface impurities, leaving skin smooth and luminous. Featuring a unique blend of natural bamboo, jojoba beads, and prickly pear, this natural, new generation clarifier conditions, tones, and tightens pores, reorienting the complexion and rejuvenating skin, leaving it in a receptive, balanced state. It does not peel off the top layer exposing the new, immature skin beneath. 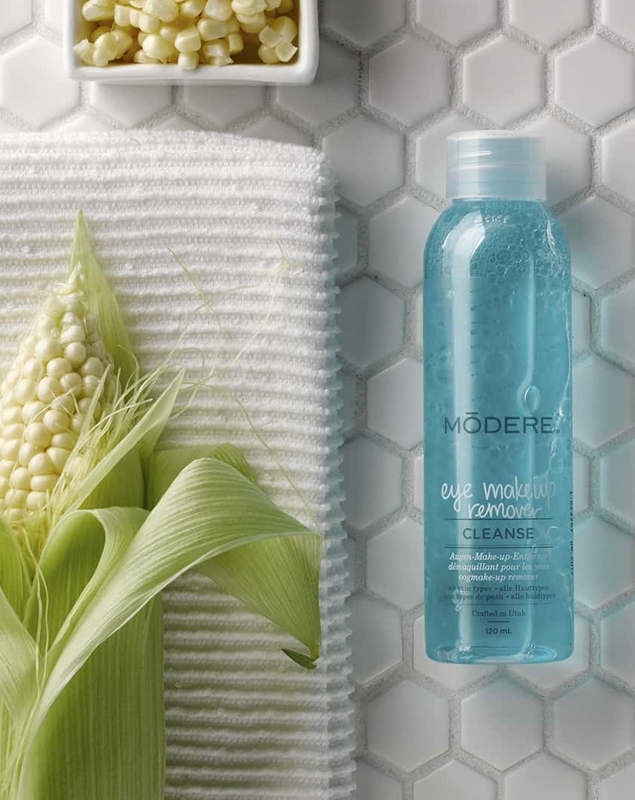 Our Toner, Combination Skin is feather light, oil-free, and uses natural exotic plant extracts to bring uneven complexions into proper balance. Effectively hydrates skin and balances the complexion. Feather light formula won’t overwhelm spots prone to excess oil. Natural plant extracts are gentle. 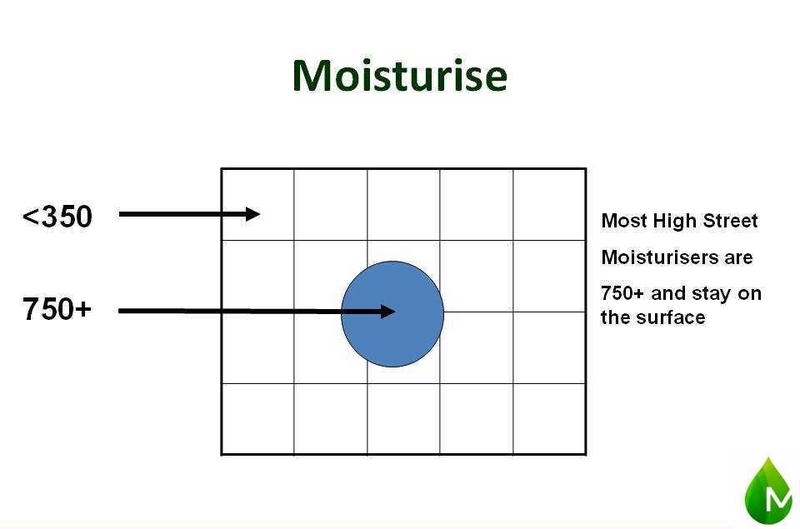 After moisturising (day and night) spray again and massage gently to carry the moisturiser deeper into the skin. This luxuriously rich lotion was developed specifically for dry complexions. Packed with powerful proteins that deliver abundant moisture, and fortified with botanical oils and Chinese Skullcap extract, there’s no better way to pamper and restore hydration to troubled skin. 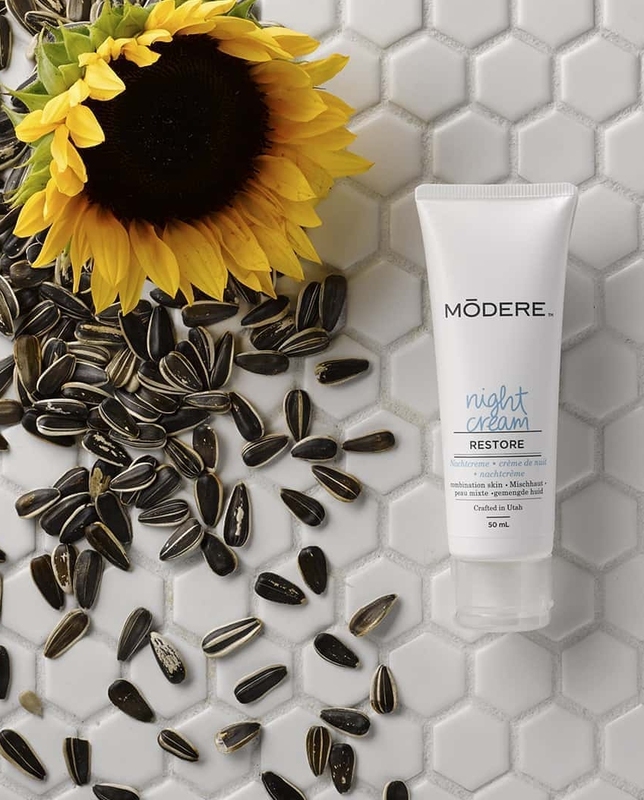 Intense moisturizer delivers vital hydration. Combines botanical oils and Chinese Skullcap extract to soothe skin. We have 5 special formulations to help with specific needs. I shall add these later. Please check back. After cleansing and clarifying the skin is now ready to be nourished with essential moisture which includes a strategic mix of vitamins, anti-oxidants and other valuable botanicals. 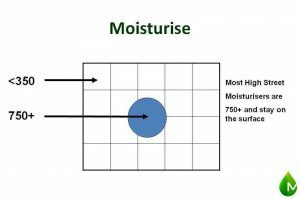 There are moisturisers for each skin type. The lotions provide SPF15 for sun screen coverage offering UVA and UVB protection. and safeguards the skin from other environmental pollutants. Protect AM lotions provide SPF 15 offer moisture and protection for skin’s daytime needs. 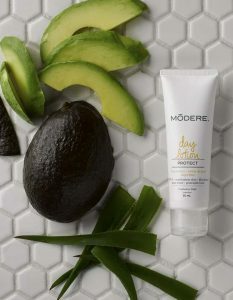 Featuring zinc oxide sunscreen, along with liposomes that assist with hydro protection, vitamins, and antioxidants, these finely crafted formulas defend skin against sun damage and other environmental factors while leaving skin smooth and touchable, as it repels daily environmental assaults while delivering protective compounds to the skin’s surface. 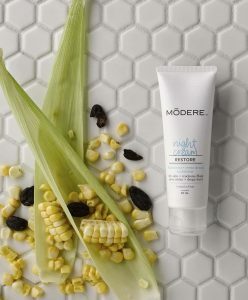 Each of the two formulas provides the required balance, ample hydration, and moisture retention for the skin’s night-time needs. With a diverse selection of natural oils, vitamins, antioxidants,and essential fatty acids, these formulations act to revitalise skin overnight. Working in conjunction with anti-aging factors, they can decelerate the signs of aging and visibly rejuvenate the skin. These dynamic formulas reinvigorate tired-looking skin, returning it to a youthful glow with important botanical extracts that improve skin vitality while you sleep so your complexion appears rejuvenated and rested.